Following Tom Kundig: Houses, published in 2006, this 248-page monograph features 17 residences by Tom Kundig, award-winning partner of Olson Kundig Architects. Designed by Dung Ngo, this volume includes a foreword by noted Finnish architect and critic Juhani Pallasmaa and an essay by Daniel Friedman, Dean of the University of Washington College of Built Environments. Featured projects include Montecito Residence, Hammer House, The Pierre, Rolling Huts, Tye River Cabin, Portland Hilltop House, Highlands House, Slaughterhouse Beach House, Studio Sitges, Gulf Islands Cabin, Laurelhurst Residence, Shadowboxx, False Bay Writer’s Cabin, Island Pool House, East Village Apartment, Chat-O Spapho, and Outpost. international practitioners. 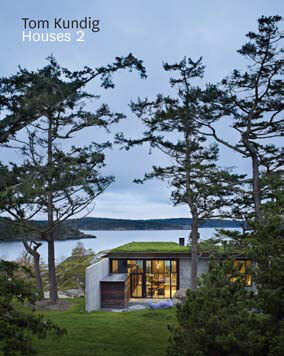 The book follows the critically acclaimed Tom Kundig: Houses, published in 2006. Kundig creates bold architectural statements by fusing the static with the dynamic, the fabricated with the natural—yet his homes maintain a simple aesthetic and exude comfort. That seamless sense of contentment derives in part from Kundig’s collaborative work ethic. By actively engaging with engineers, interior designers, craftsmen, artists, and other architects, Kundig’s attention not only rests on the structure, but with the mechanics of moveable features, micro-architectural elements, custom fixtures—and the way each of those systems responds to the natural landscape. from majestic Northwest forests to Western high deserts and New York City’s urban grid.